Introduction (H. Lieth, M.J.A. Werger). Climate and Weather (W. Lauer). Vertical Stratification in Microclimate (T. Kira, K. Yoda). Soils (P.A. Sanchez). Hydrology (W.L.F. Brinkmann). American Tropical Forests (G.T. Prance). Vascular Epiphytism in America (D.H. Benzing). African Forests (A. Hamilton). Vascular Epiphytism in Africa (D.R. Johnsson). Southeast Asian Tropical Forests (T.C. Whitmore). Dipterocarp Reproductive Biology (P.S. Ashton). The Rain Forests of Northeastern Australia — Their Environment, Evolutionary History and Dynamics (G.C. Stocker, G.L. Unwin). Vascular Epiphytism in Australo-Asia (B.J. Wallace). The Forests in the Tropical Pacific Archipelagoes (M. Schmid). Lichens (H.J.M. Sipman, R.C. Harris). Bryophytes (S.R. Gradstein, T. Pocs). Pteridophytes (R. Tryon). The Climbers — Lianes and Vines (E.E. Hegarty). Primates of Peninsular Malaysia (E.L. Bennett, J.O. Caldecott). Bats (D.E. Wilson). Rodents (F. Dieterlen). Birds (J.R. Karr). Herpetofauna of Tropical America and Africa (R.F. Laurent). The Spatial Distribution of Flying Insects (S.L. Sutton). Moths (J.D. Holloway). Termites (N.M. Collins). Leaf-Cutting Ants (J.M. Cherrett). Dung Beetles (I. Hanski). Herbivory and Secondary Compounds in Rain-Forest Plants (P.G. Waterman, D. McKey). Mycorrhizas (D.J. Bagyaraj). Decomposition (M.J. Swift, J.M. Anderson). Decomposition in Tropical Rain Forests Compared With Other Parts of the World (G. Esser, H. Lieth). The Exploitation of the African Rain Forest and Man's Impact (R.M. Lawton). Exploitation in Southeast Asia (K. Kartawinata et al). Use and Misuse of Tropical Rain Forests (E.F. Bruenig). Author Index. Systematic Index. General Index. After publication of the first volume of the Tropical Rain Forest, the International Journal of Mycology and Lichenology commented This is a welcome addition to the literature on the ecology of tropical rain forests. The book provides a wealth of data and stimulating discussions and is of great interest to ecologists interested in tropical areas.'' Whereas the first volume dealt with system-ecological aspects such as community organization and processes, the present volume concentrates on biogeographical aspects such as species composition, diversity, and geographical variation. Recent ecological research in the tropical rain forest has greatly extended our understanding of biogeographical patterns of variation in the various groups of organisms, and has revealed many of the ecological and evolutionary forces that led to the present patterns of variation. Many important systems of co-evolution between the tropical rain forest ecosystems have also come to light, and the loss of species and related damage is better understood in quantitative terms. 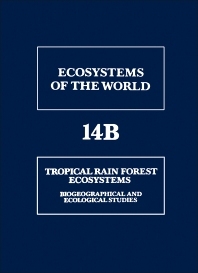 This volume presents a comprehensive review of these and other features of the rain forest ecosystem structure, and the ecological processes operating that system. General chapters on abiotic and biotic factors are followed by specific chapters on all major groups of organisms. Prospects for the future are discussed and research needs clearly stated. Also the human exploitation of the system, its effects and its limits are discussed. The book is extensively illustrated by photographs, graphs, and tables, and comprehensive bibliographies follow each chapter. Author, systematic and subject indices complete the book. It is a must for all ecologists, agriculturists, foresters, agronomists, hydrologists, soil scientists, entomologists, human ecologists, nature conservationists, and planners dealing with tropical areas. Biologists and environmentalists will also find the volume of great interest. Fachbereich Biologie/Chemie, Universität Osnabrück, Osnabrück, F.R.G.